The Thomson carbon fiber road racing handlebar features a mild wing shape on top, clamping area wide enough for aero bars, and mid-compact reach and drop. This is the modern road racing handlebar bar for the modern road bike. Our road bar wing section is small enough not to restrict hand movements when riding on the top, and allows bar angle adjustment without “locking out” your wrists. Shaping on the bottom side of the wing allows housing to be taped out of the way without the use of narrow housing channels or internal routing, both of which shorten bar life. Certified to EN, tested to DIN+. For Cyclocross, we present the Katie Compton Signature ‘cross bar. Katie brings her multiple championships, European racing, and Olympic experience to give you a bar built her way for ‘cross. It’s the natural transition from your Thomson road bar for the ‘cross season. Twin flats on the bottom of the bar allow taping your housing to create a round bar when wrapped. The top profile is round and as wide as possible. 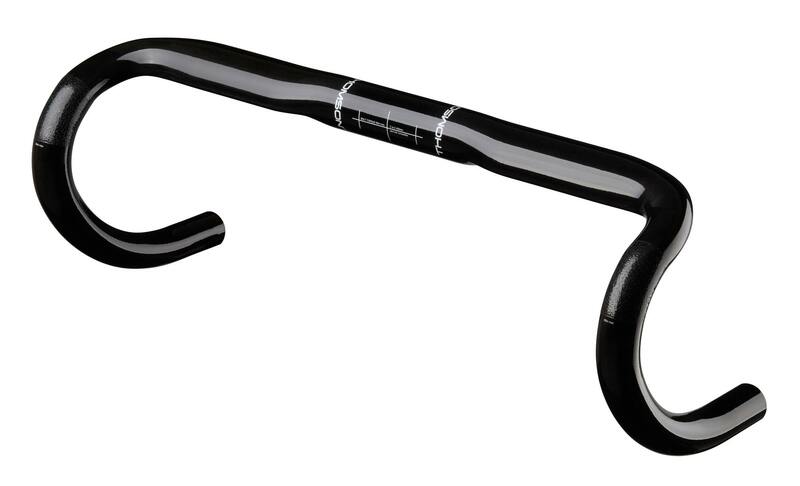 This is the carbon fiber cyclocross handlebar built to take all the season can dish out. This allows auxiliary brake levers to be safely used and still leaves lots of room for your hands. Certified to EN, tested to DIN+.